Bowles spent much of his life in Morocco and wrote his fiction there. This familiarity is immediately visible in his writing in this book set in the city of Fez. The first and second parts of the book are about Amar, a 15 year old Arab boy, who has dropped out of school unable to read, working in several jobs placed by his father and one with a potter which he finds himself. We see Amar negotiate both the city physically and culturally. Although he is anti-French, his upbringing has been orthodox Islam and so he is not attuned either to the ways of the nationalists, the Istigal. He fails, for example, to understand that there will be no sheep for the Eid slaughter because of the undercurrent of rumoured uprising against the French who have deposed the Sultan and installed a puppet regime. In the third part of the book, we meet the hotel living foreigners, the main one, Stenham, an American who was introduced very briefly in the opening prologue, has lived there for many years and naively wishes for what he sees as the traditional Morocco to live on, detesting French colonialism and Moroccan Nationalism equally. We see a slow build up of behind the scenes tension as the political situation in the country begins to simmer towards an ignition point around the forthcoming Eid celebrations. The foreigners are aware that something is up, but not in the same way that Moroccans are aware. This different perspective is seen throughout with respect to religion, life and death, woman, fatality, social customs and ritual. As the climate of unrests heightens, the lives of Stenham and Amar are brought together in the fourth part of the book when the hotels are forced to close and they flee Fez and attend a festival in the mountains. In the final fourth part of the book, Amar leaves the mountains and ends up back at the country house hideaway of Moulay Ali, a mysterious figure he first encountered in the first part of the book. Moulay Ali tricks Amar into taking over from him the playing a song on his lirah, so ensuring that he and his Istigal followers can escape the encroaching police. There are some delightful moments in this book, for example, his descriptions of the town and people – I loved the vision he paints of the bus load of people returning from the mountains, swaying and zigzagging down the mountain roads, singing to seem like pilgrims in order to escape being stopped by the authorities. 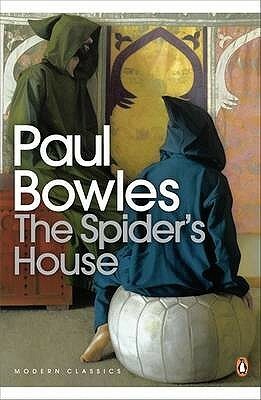 I feel it would benefit from several close readings to understand better the nuances of how Bowles portrays the problems of (mis) understanding between the cultures. As for the flimsy plot, for me it gets completely lost in the third section, when Amar’s story is totally overcome by the focus on Stenham. ashramblings verdict 3* A good book which sadly goes slightly too far off track in the middle, unsure as to who is its main character.